YOUR SHAVE WILL LAST LONGER: When you use a normal safety razor, you need to shave every day. 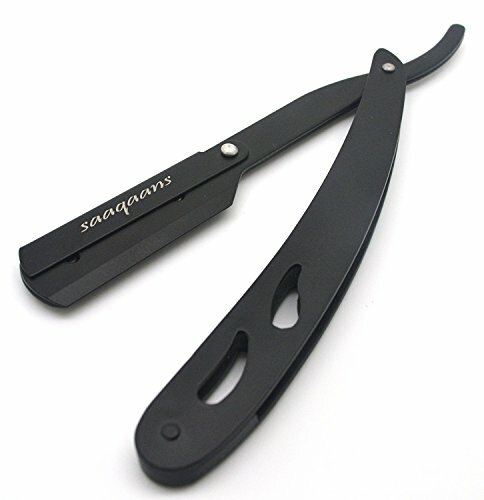 But using this shavette razor your skin only needs to be shaven every other day. You will look cool and by using a straight razor you will impress most of your friends and probably also yourself. BETTER FOR YOUR SKIN: Three or five blade razors irritate the skin much more and you need to press it hard against your skin to use them. This is why this shavette razor is so great and often using for better skin care products than the average shaver. Your face will thank you later. LOT OF BEARD TO SHAVE OFF: When you have a lot of beard to shave off, it is much easier to shave with this razor than other expensive razor because the beard gets stuck between the multiple blades razor and you often get a tugging sensation that irritates you. But with this shavette razor you can go much closer to your skin without sticking. WHICH BLADES NEED TO BUY: This shavette uses half of a double-edge razor blade so you can buy any standard double edge razor blades like (Derby, Astra, Gillette 7 O\' clock etc) which are readily available in most supermarkets as well as online. For blade installation please see below in the description. WHAT\'S INCLUDED IN THE PACKAGE: You will get one branded straight edge shavette razor with 20 Extra double edge razor blades in a beautiful pouch with a manual instructions included in the package PLUS you will get FULL 30 DAYS MONEY BACK GUARANTEE in case if you are not satisfied with the product.